I can't believe how close Easter is, it sure came fast this year. I have been having fun making Easter items but I also need to get onto some quilts and summer items for me. I made a couple of chicks and had no where to put them, so today I made them a nest. I had some old straw hats from my doll making days and thought it would make the perfect nest. I took a pair of scissors to them, cutting some chunks off and around the brim, then I cut off half of the top. I brushed antique medium onto the hat to age it a bit and let it dry. Then I added some spanish moss for the nest and some store bought eggs and you have a quick and easy display for your chicks. This weekend I wanted to keep my hands busy but not think too much. A friend sent me a link to free patterns from Theodora Cleave and I thought it would be fun to make one. 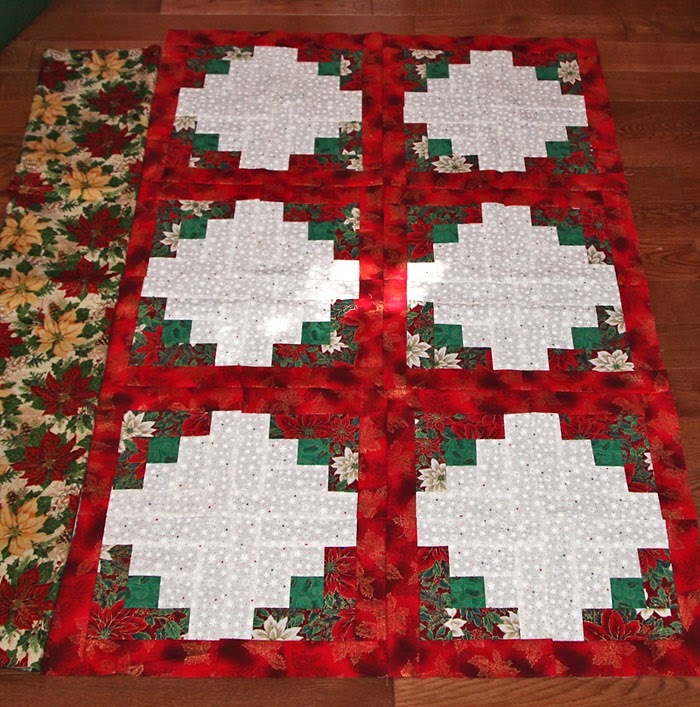 She is giving away the whole set so you can make mini quilts with some or use them all and make a full sized quilt. I am not sure yet, what I will do. 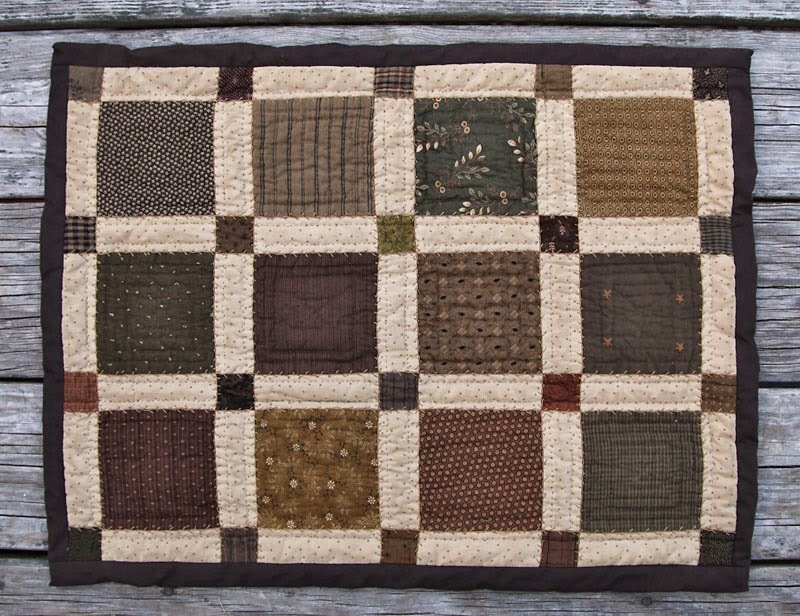 Minis are nice to give as multiple gifts and a regular quilt would make a nice quilt too, so I will decide later. This is what i have so far, I have worked on it more today. I will be adding some color, green and red with a bit of yellow and brown. I am using tea stained muslim for the background. Today it was nicer out, so I was able to get outside to play with Bean. 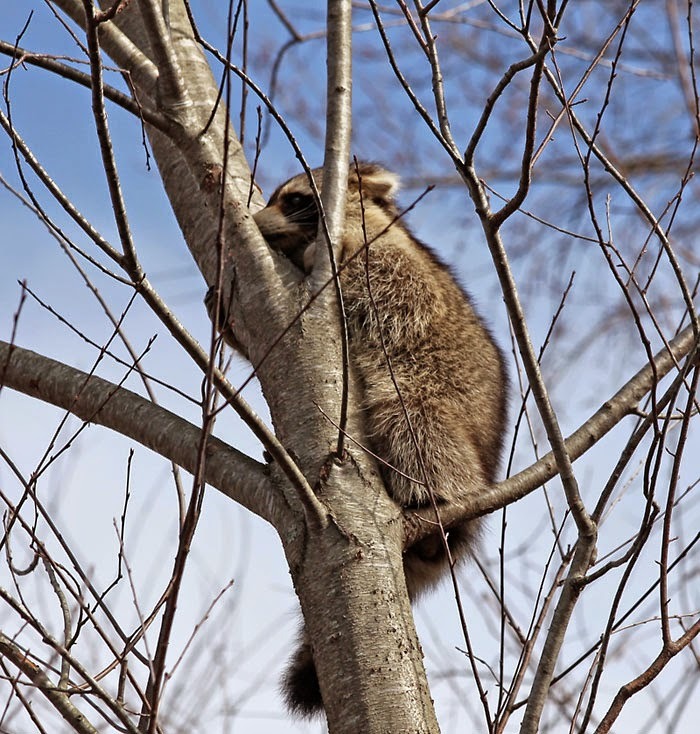 When I opened the door I saw a critter just coming out of the pathway and when he saw us, he ran up the tree. The poor thing was not expecting people, or a dog, so he climbed to the top and played dead, lol. Then my neighbor took his pup for a walk down the path and the poor guy just sat there, it took him 20 minutes before he realized no one else was going to come out. I am seeing more and more critters lately, so I guess that is a sign that Spring is actually coming, albeit a bit slowly. This week I hit 500 followers and I wanted to thank all of you who visit my blog with a little gift to make for Easter. I found the design in an old book that I found in a thrift. It is called A Treasury of Needlework Designs by Martha Zimiles. I took a flower design and remade it to fit the egg shape and a few vines. I got the idea last minute, so I just made it up today and I think it would be fun to do it in different shades and edgings. 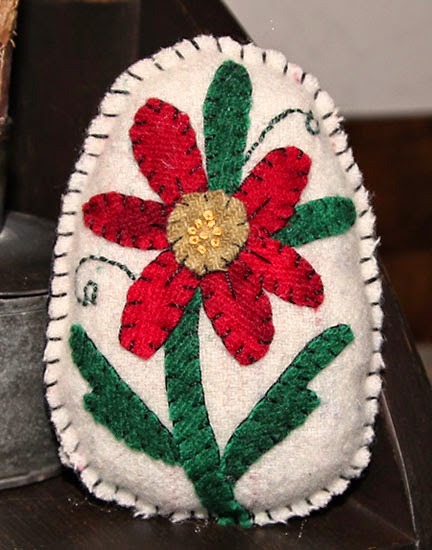 The wool for the egg is a loose weave, white with flecks of easter colors but the flash washed them out. I didn't think it would sew well on the machine so I hand stitched it with a blanket stitch. A trick I learned, when trying to trace a design onto light wools or felts, draw your design in a thick sharpie, it will show through on a light box. I like to trace the design with a blue washable marker, so I can place the pieces as I got and not have to worry about placement. When I use a blanket stitch, I use a few pieces of batting and add stuffing between that so I don't have to worry about the stuffing coming through the spaces. 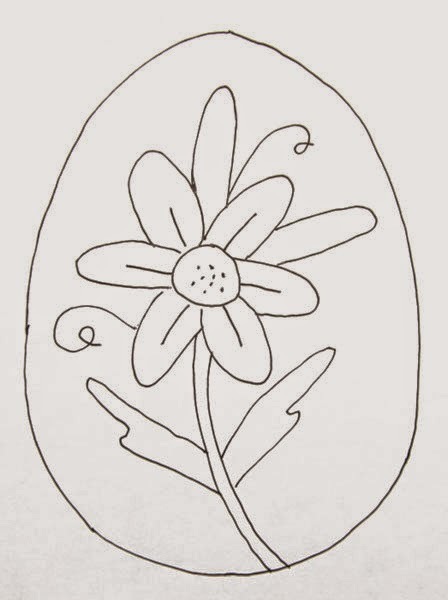 Here is the design I made up for the appliqué egg, you may use it in other mediums, as well. I am thinking it would be fun to needle felt one and use some of my variegated roving. I also finished my BOM by Stacy of Buttermilk Basin. I really like how it came out and can't wait to see what next month's block will be. The puppy magnet is a free pattern that can be found at Apine Industriose. I used two in mine, one in front and one in the back, so it can hold up heavier pieces like this. I was able to get in some sewing time this weekend and finished one piece, made another and started to finish a UFO. The first piece is a design by Plumcute Designs. This was one of the free designs in the Buttermilk Basin spring hop. The original design is in a small hoop. I planned on putting mine on a wood heart, but the piece was too big for my heart. So, I went with a simple square pillow and added the saying. I added a bumpy yarn by using two strands and gathering it, as I went around to get a full decorative border. I added a cord so I could hang it on my peg rack at the top of the stairs. 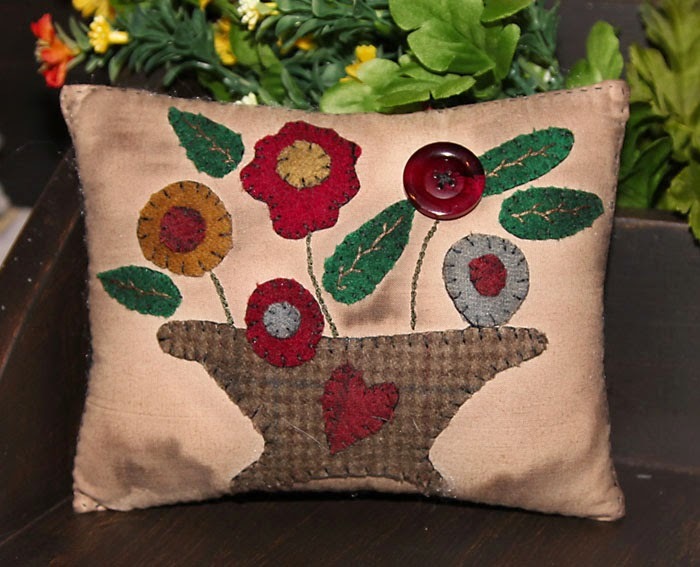 This next piece is a free design from the Wool Applique group on Facebook. Trish from Attic Heirlooms is offering the designs and she also offers them on her website, but you have to get them during that month. 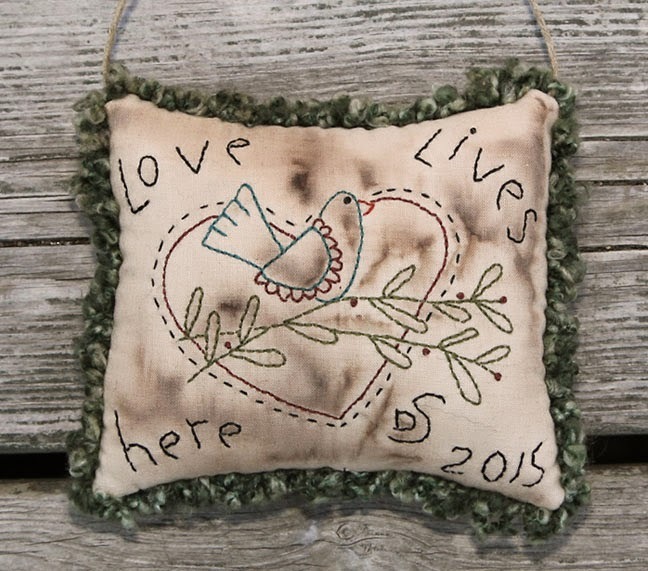 I am making mine over sized because I will be hanging them on a line with clothespins, for a Christmas garland. The middle section is white so I am trying to decide, if I quilt it, how should I quilt it and what design. 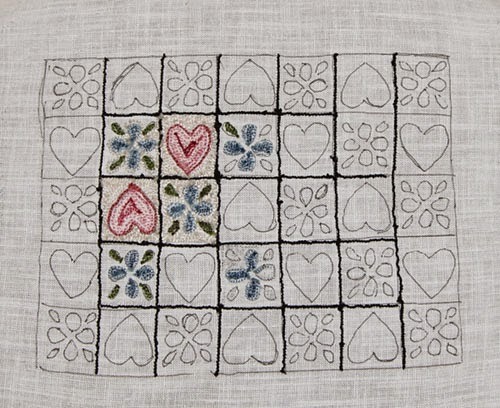 I wanted to hand stitch it with black threads but not sure if i can do a nice design that way. Or, should I put an appliqué in that section? Would love suggestions. I bought material to match it, but I wonder if it is too light? What do you think of the border fabric? It is more tan than the middle sections, but I plan on tea staining the piece, so the middle will be darker in the end. I hate to buy more fabric but I could also go with a dark red or green for the border? 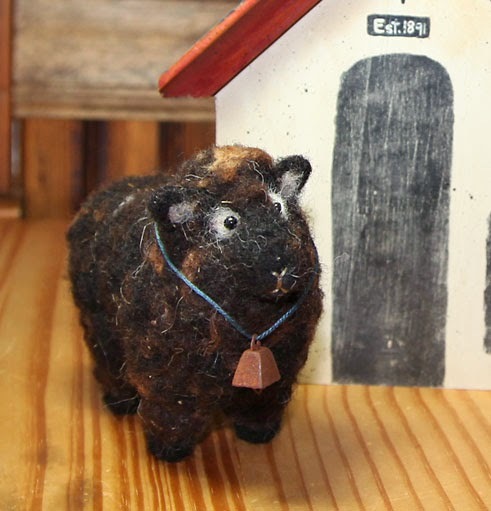 This week I got the idea to make a needle felted sheep. 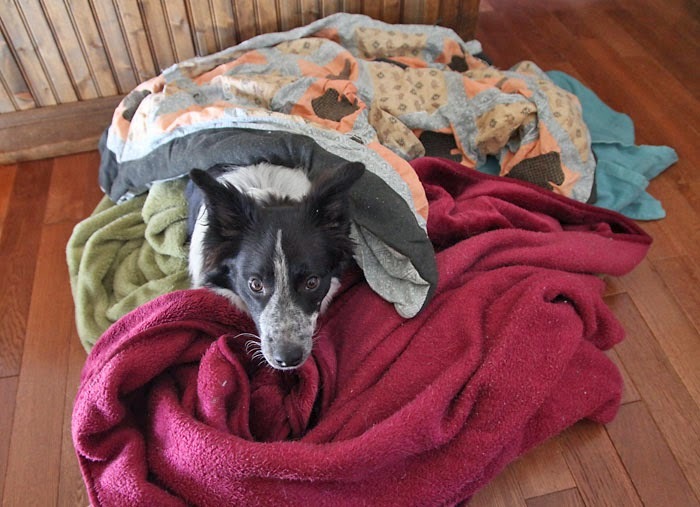 I had a pattern that I found online but I got lost when I went to put on the outer fibers for the sheep fleece. 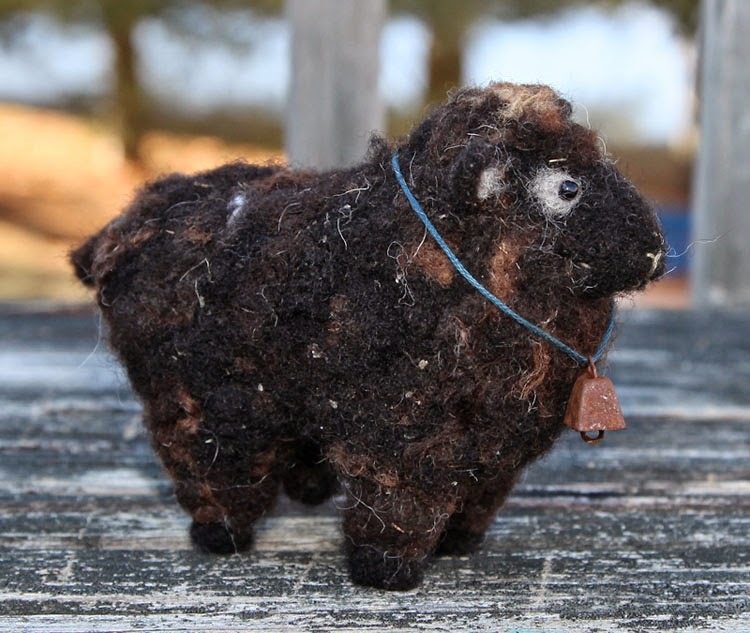 I thought the roving I had would work nicely since it was sheep wool, but I ran out and the only other dark color I had, made him look like a bear. And, by mixing the colors, he looks like a bear with mange, lol. I got him as finished as I could and added a face and of course, he looks a bit comical now, but I am learning and it is fun to experiment. The photo is horrid, I tried all types of light and I could not get a good photo with definition, he really looks better in person and he is so bad that he makes me smile. And here is a side view outside. Maybe I will try something smaller and simpler, next time and get better at my felting techniques. 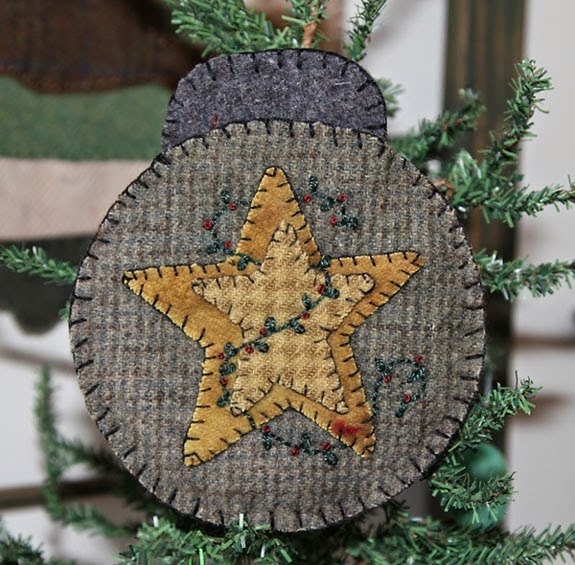 Another piece was a design by Debbie of Wooden Spool Designs. I thought it would be a fun little piece for spring. I didn't realize it had a front and a back, so mine is just the backing, but I still like how it came out. I enlarged my backings by 10% to give me a little more room for the design. And of course today was cleaning day. I like to have everything done so Bill and I can enjoy the weekend, and relax. 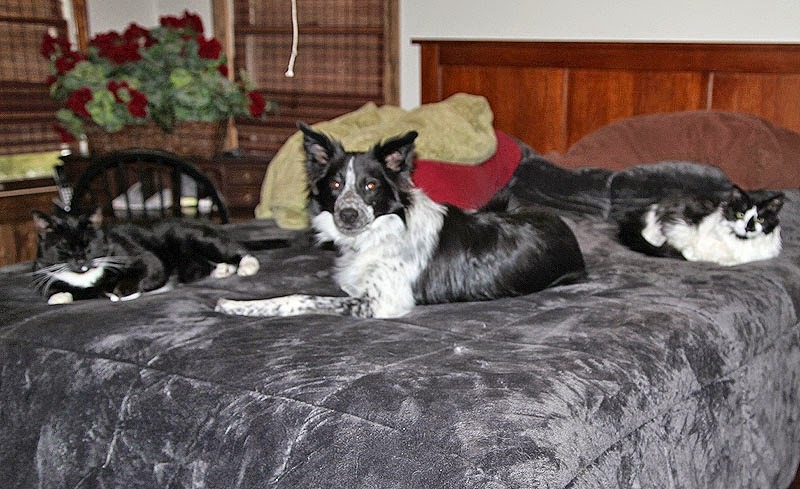 I was doing laundry and went into the bedroom, turned around and this is what I saw. I am in trouble now, this is the first time he has gotten on the bed and my bed is 36" high, so he is a jumper. He really hates that the kitties can get up on high places, now he can too. 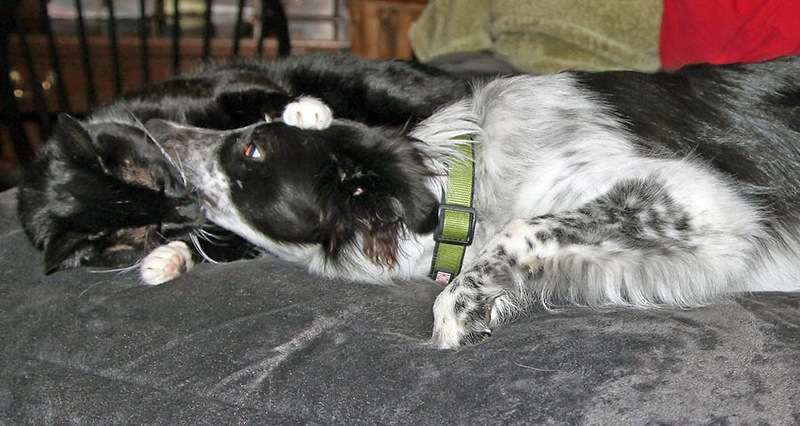 He loves to play and snuggle with Moki and Moki is sweet enough to put up with him. I hope everyone has a wonderful weekend. This weekend I was able to get in my sewing room and clean it up a bit. I have projects that need finishing and some to put together so I have projects to work on later. 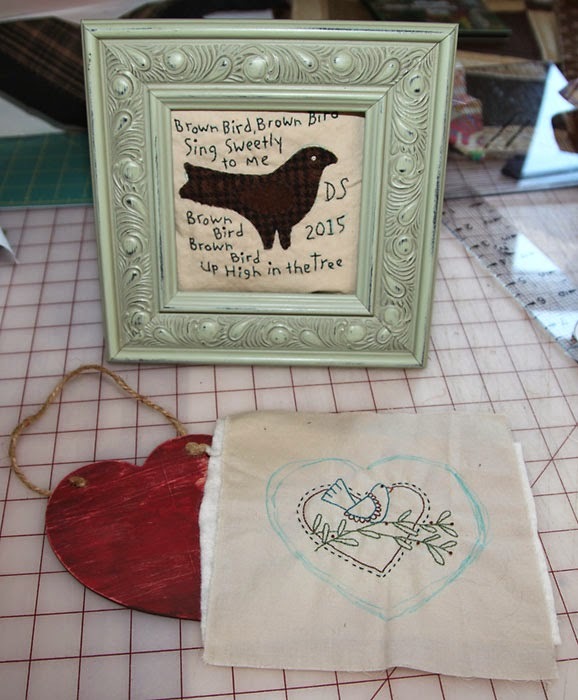 This weekend I sewed borders onto the little quilts, that my friend Kelley sent me. They were all finished and quilted, I just needed to add the border and I have two new table mats. I love the pattern and colors on this one. Now that I have a blue couch, it is nice to have blue pieces to match it. It is hard to see because of the flash but this and the next piece, were tea stained after I finished them. It doesn't darken them up as much as the walnut ink, but it gives it a lighter aged look. 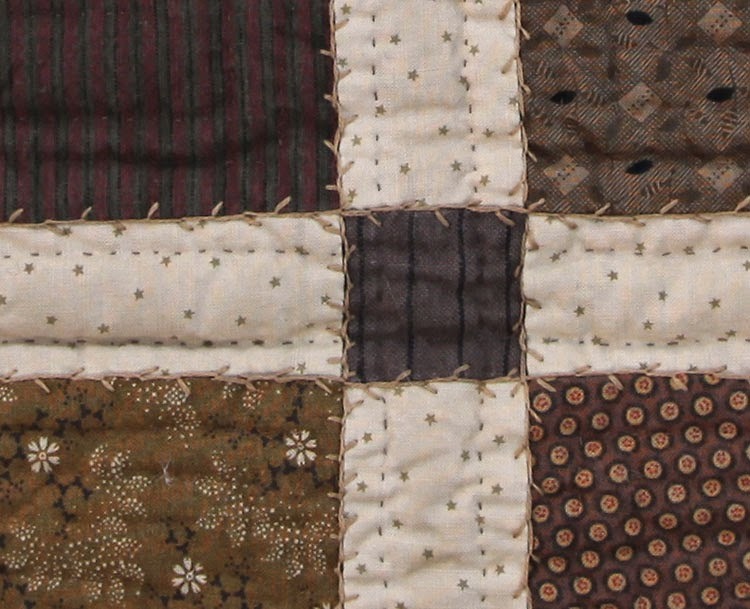 The second piece was quilted, as well but not on the seam lines so it puffed up a bit. I decided it would be fun to add a feather stitch to the edges and I like how it came out and gave it a new look. Here is a close up of the stitching, I used two strands of DMC floss. 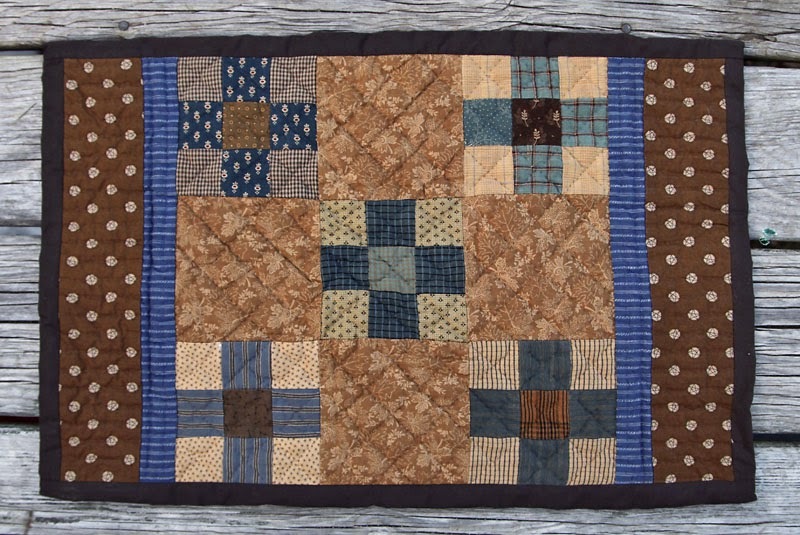 The quilts look crooked because of the borders. I thought I had bought cotton but when noticed how hard it was to push a needle through it, feels like lightweight jacket material and it puckers. The white materials are actually yellow, so you can see how the flash washes out the staining. Another project I started is a mini rug for my Grand Niece. She got a doll house for Christmas and everything is pink and blue. I looked in The Rug Hook Book and found the perfect rug, it was done in pink and blue and will match her doll house decor. It is larger than most of my pieces and I am doing it in 3 strands of floss, so I am working on it, a bit at a time, so no hurry. I had a slow start to the week but I finally got some time yesterday to make a few things. 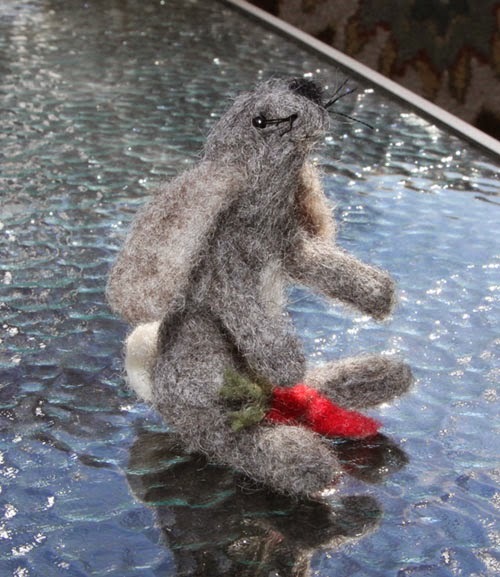 I have been collecting needle felting supplies since a friend sent me some and yesterday I made a bunny for Easter. I got a book from the library called Little Needle Felt Animals, by Gretel Parker. It has a lot of cute animals, done is a cute artsy style so great for beginners. The rabbit in the book is called Moon Gazing Hare and was a basic rabbit with ears, short legs and a tail. Of course I had to completely change it and make mine with legs and arms, as well as floppy ears and more facial features. I also made a carrot for him. I learned a few things while making him. Always felt your parts to completion before you attach them. Once they are on, it is hard to felt them into the shape you want. I also put the ears too low, but all in all, I think he is cute and it was fun to make. 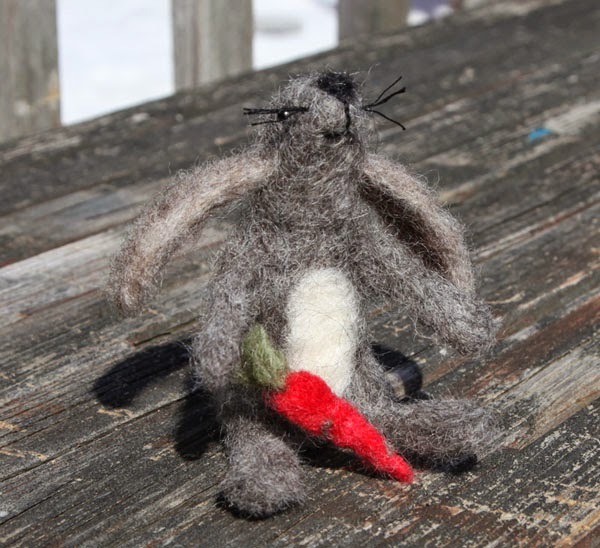 The photo makes him look fuzzy, but I felted him into stiff parts, then added a little bit extra at the end to give him a more soft bunny look. Here is a view with his tail. I went with the traditional puffy tail. I also wanted to try a sock bunny that I found from a free pattern online. She used a baby sock but I couldn't even find a small colored sock, so I took one of my husband's single that I was saving to find the match. It was way too big and I used the inside of the sock for the fluffy head, but the body part is not as nice. It was fun to make though and would be fun to get some socks at the thrift to use for animals. I stuck the homespun around his neck, still debating on how to finish the body. You can find the Tutorial Here! Today I got my new stove, so nice to be able to bake again and of course make more cookies. I am so happy with how it cooks, so much better than my old stove and my cookies came out, just right. I also did Beans laundry, of course he had to help. 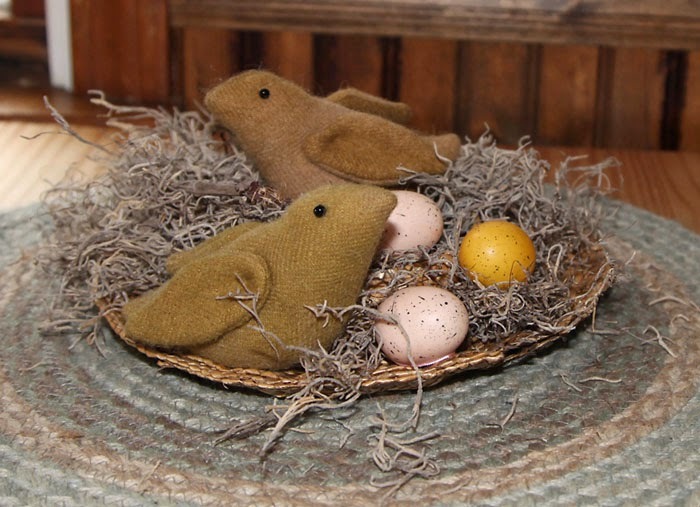 I was looking for an old basket that I had, for the sock bunny, thought I could put him in with status and some old looking eggs. I never found the basket, but found this old piece that I made in the 80's. 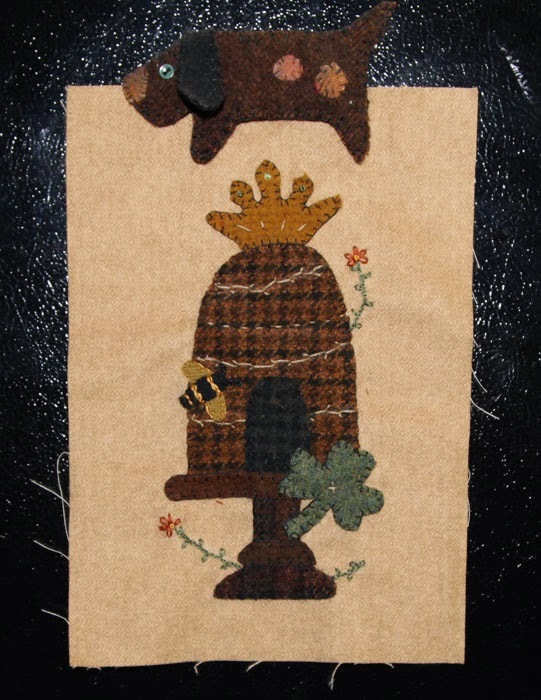 It is when I first started doing appliqué and used what I had, and felt for the appliqué. I made up the design and I notice it is a bit crooked, lol. The background fabric is something I hand dyed. 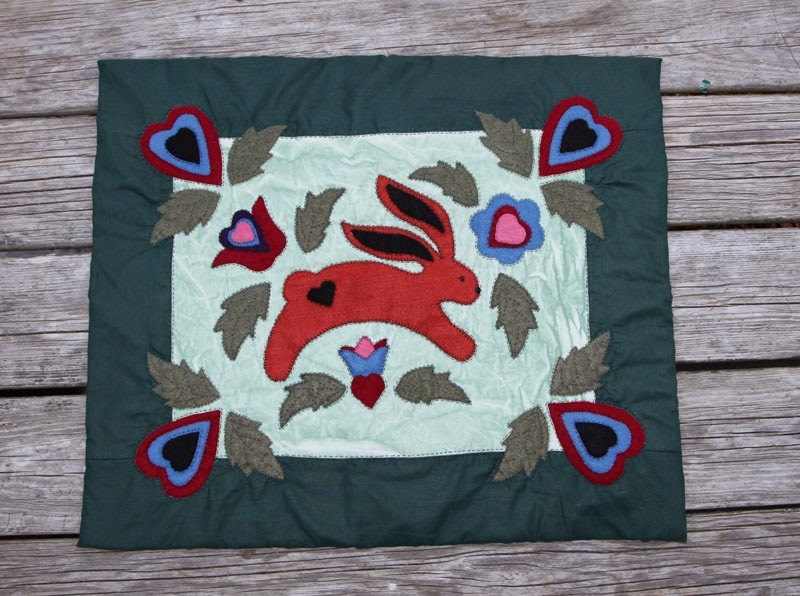 Hard to see the rich colors of the piece in the photo, the bunny is a rusty brown. This weekend was a blur, I think the time change has messed me up again. Just when I get used to the fall back, it is time to go forward. I do enjoy the longer days though, and once the snow melts, I can get out for walks with Bean. I really liked the bunny design and wanted to try it in a different medium, so I went with needle felting. I received some supplies from a friend and have been collecting roving and it is time to start using them. I made an egg shape and used wool felt to felt on. It was fun to do and I learned some things along the way to get better results in my next piece. 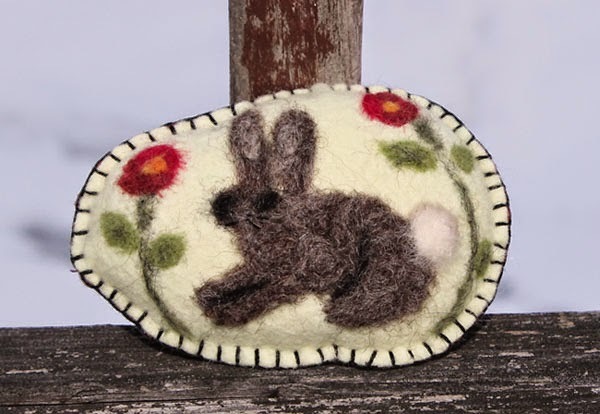 I may try a felted eyeglass case next, I like the idea of making them for gifts and want to try something artistic with wet felting. I used a light yellow felt for the backing, and it was nice since I could trace the design onto the felt, to have a guide for felting. I also made a piece from the Buttermilk Basin hop and another design by Renee Plains, I just need to finish them. I got the idea of cutting around the heart and placing it on a wooden heart, then I found out it doesn't fit, so have to rethink that one. The bird stitchery will go in this frame, I need to do some trimming and get something for the back, then I can frame it. And guess what I made today? Cookies! 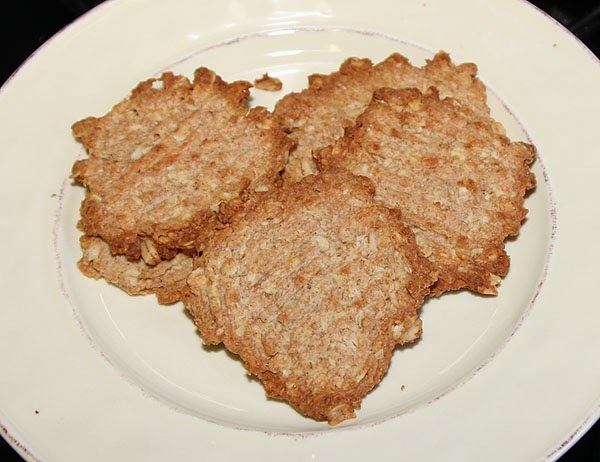 I really need my cookies, they are made with oatmeal, brown flour and grated apple. I add a stick of butter, but I figure the good ingredients out weigh the butter, lol. I found a counter top oven this weekend and I had a 30% coupon, so it was a good deal and I can use it now and save it for camping if we get a trailer without an oven. The bad thing is, I only had the one small pan that it came with, so I could only cook 6 at a time, so it took a few hours to make them, lol. I have been having fun following the spring blog hop, hosted by Buttermilk Basin. 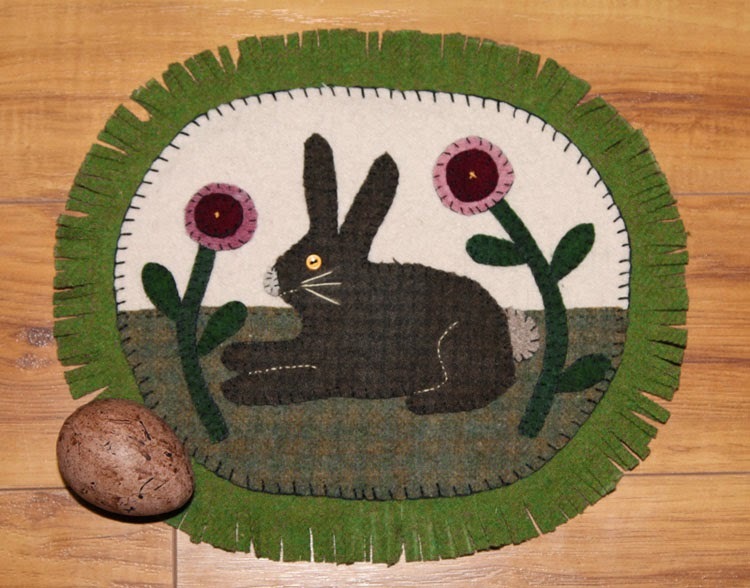 This week I finished a cute bunny mat, designed by Jeni from the Willows. It was an easy project and I love how it came out. The only problem is, I used a soft, thin wool for the border and that was a mistake. The cuts are made to emulate grass and as I ruffled it up, some of the pieces pulled off. So, I put the egg on that section and it is ok for now, next year I can take it apart and put a thicker backing on. It is a bit white washed from the flash. But I wanted the colors of the other wools to show so the white is glaring and the floss is brighter, than it actually is. 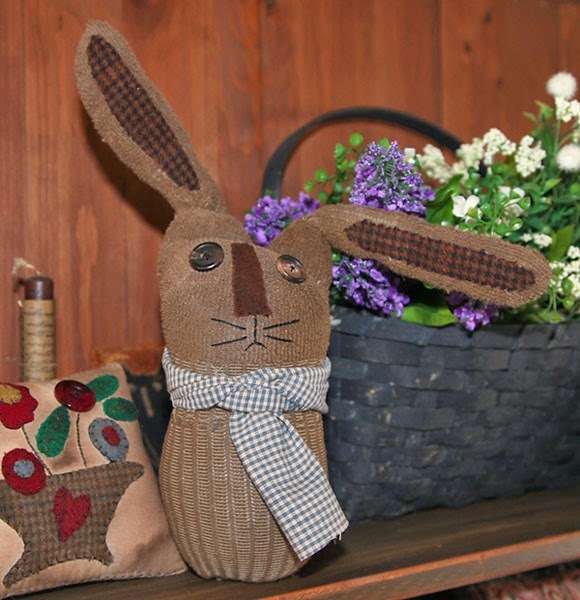 If you haven't seen the Spring Hop, the patterns for each day are still available and well worth a look. This week I noticed my oven was not working right and I would smell gas, then it took a few minutes for it to start. Then I told Bill to check it and it wasn't working at all, so, no oven this week. We went to the store and picked one out, it would take a month to get so I said no. Then I saw another that was the same except for the looks, but it did the same things and had the fifth burner, so that is coming next week. The bad thing is, I make cookies as a snack food. They are healthy since I don't use sugar but I cannot make them and I need to snack, lol. Today I tried some fried chips. 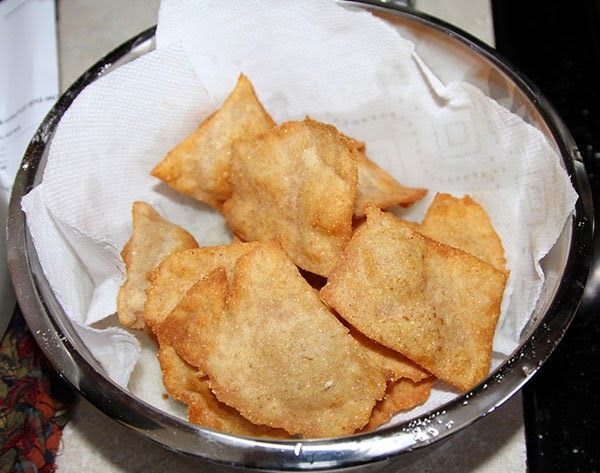 I mixed white and brown flour, along with cornmeal and fried them. They taste really good but a bit greasy, so I need to modify the recipe to make it healthier, but a nice idea for summer snacks too. This weekend I was able to try some projects and spend time relaxing. Nothing like another snow storm to keep my in the house and with Bill home, I had someone to play with Bean so I could get things done. I had received a notice about a sew in to make pillows and bags for breast cancer patients. The pillows are to hold under their arms to reduce pressure and upside down, work as a cushion so they can use a seat belt. The bag is to hold and hide the drainage bag. I love the idea of helping woman who are going through tough time and if you are interested in helping others, you can visit Jennifer's Facebook page for contact information, or email me and I will be happy to send you the pdf file, with the patterns and information. I am not happy with my sewing skills, I measure and leave the correct seam allowance and still get the wrong size. I also think I made too big of an opening. The bag is the wrong size, I am short 1/4" on both sides, so I need to practice on some other fabric till I get it right;) I did mine with an inner lining and I am still thinking about how to attach the handle so it looks nice. 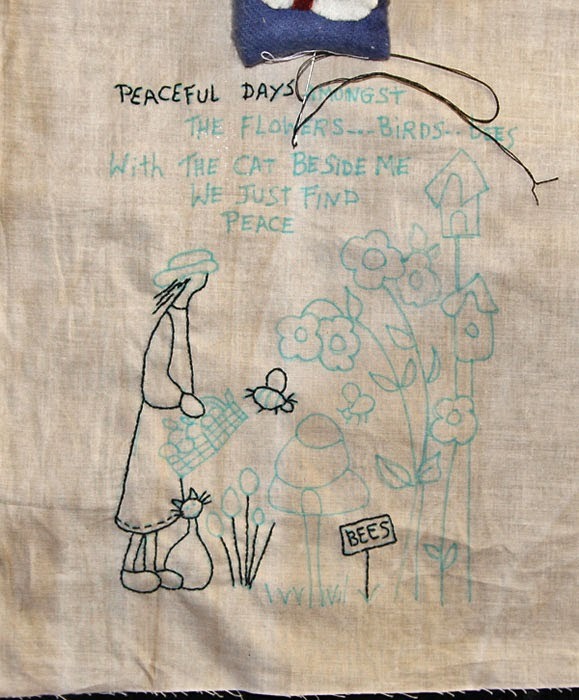 The beautiful cat fabric is a gift from Marylou Weidman. 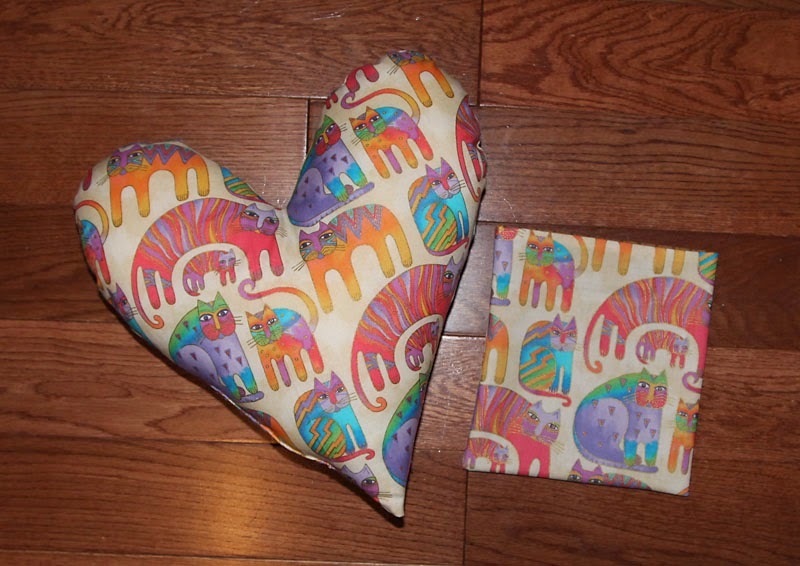 I thought it would be nice to pay it forward by using it to make some fun pillows and bags and I have more prints that she gave me. 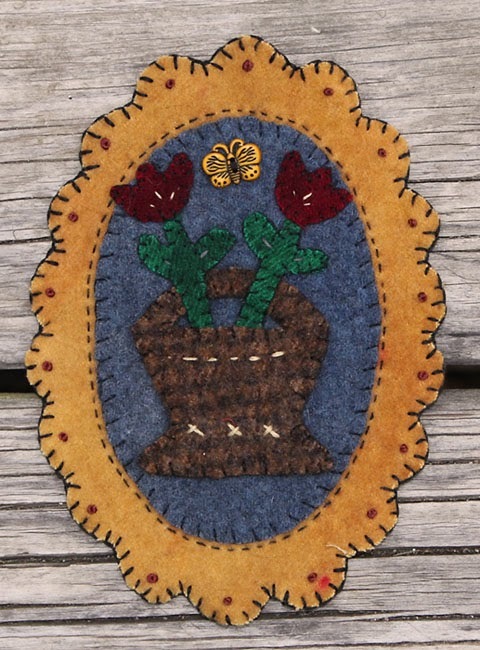 Another piece I finished was the free design offered by Cheri Saffiote for the Buttermilk Basin Spring Blog Hop. I love Stacy's hops and all of the wonderful artists who offer free designs for us, to use. I made mine into a pillow and antiqued it, it was a fun project to do. Today there is a stichery and I can't wait to see what tomorrow brings.